Ano Mera, in a beautiful and quiet area a villa 230 sq.m, in excellent condition and well maintained, constructed on a plot of land 4,120 sq.m consisting of the main house comprising a master bedroom., with an ante-chamber consisting of sitting area & kitchen with serving hatch, dressing room, large. bathroom. and a large veranda with pergola. The master bedroom covers almost the whole of the upper floor which could be used as an independent apartment. The Ground floor consists of a living room with a continuation of a dining room and spacious kitchen with serving hatch, one bedroom and WC. There are also 3 independent guest houses each with bathroom, small kitchen & refrigerator. One of the guest rooms has a living/room with 2 large sofas which may also be used as extra beds. All areas are spacious and comfortable. 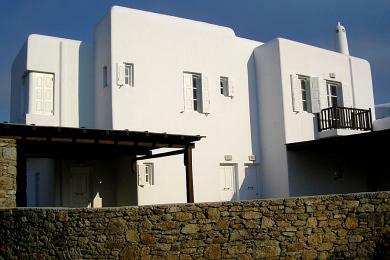 The construction is 100% legal, of very high quality & technology and constructed from first class materials which make it highly suitable for the variable climactic conditions on Mykonos island. 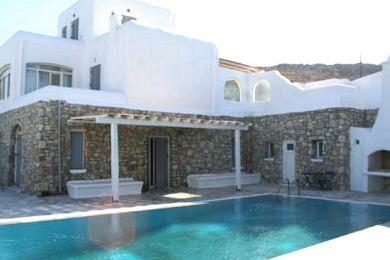 The property has a water supply to allow for construction of a swimming pool at minimal expense. There is also a small chapel, newly renovated containing exceptional examples of holy pictures and icons on the walls and ceiling. The view is unlimited across the whole expanse of Ano Mera.